8 Indigenous Groups... - - Boruca, indigenous of Costa Rica. Costa Rica - Land of rain forests, of amazing wild life, and symbol of success in the third world. Behind the mask of a perfect honey moon destination, hides an entire community of indigenous people, ignored by the rest of the population. More than 63,000 indigenous ( 1.7% of the country’s population), lack representation and suffer from discrimination in the land inhabited by their ancestors long before the Spaniards arrived. The increasing loss of territories is the major problem faced by indigenous peoples and it is the source of other difficulties such as the creation of educational systems and political ideologies. Eventually, everything about their cultural identity is affected by changes of culture, economy and politics. Traditional practices continue to be deplored, even persecuted, as is the case for traditional medicine, indigenous religious beliefs and social customs. In this land rich of forest, volcanoes and white sand beaches, still live eight different ethnic groups, on both sides of the Atlantic and the Pacific. The indigenous people of Costa Rica are the Gutatuao/Maleku, Chorotega, Huetare/Quitirrisi, Cabecare, Bribri, Terraba, Guaymie, and Boruca. The government implemented 24 reserves, with communities very different from each other, culturally and linguistically. The indigenous people of Costa Rica are the descendants of the Mayans and the Indians from the Amazonian forests. In the reserves, Indians live as they have for centuries, in isolated little groups, hunting and working on their land, making handicrafts. It is the Boruca, that are my closest indigenous group living near us in the southern Pacific zone of Costa Rica. Boruca is built on faith in the wisdom of elders and the Boruca legends they tell, passed down for centuries. The identity of Boruca reflects a deep respect for the stories told, the nature that surrounds them, and the community they share. The Boruca people are very proud to have survived the struggles between the native tribes and Spanish conquistadors in the 1500s with their village and sense of identity intact. While many indigenous tribes consider themselves to have been defeated by the Spanish, Boruca demonstrates that a tribe cannot be defeated if its culture is still alive today. Boruca is very much alive and fighting to preserve their identity. Life in 14th Century Paradise...not for the Chorotegans! Costa Rica a paradise - so the indigenous thought - until the Spanish conquest in 1490-1520 AD. The new world expeditions were usually characterized by violent nature and disrespect for the native people. The inevitable end came with "Colonialism and Christianity ". Until then, 8 indigenous groups (Brunca/Boruca, Chorotega, Huetar/Quitirrisi, Cabecar, BriBri, Teribe, Maleku, and Guaymi/Ngobe) were living in peace. With the coming of the Conquistadors the Indians had to either fight or flee inland to more remote areas, often burning their own villages and crops behind them. At this time the Chorotegans (descendants to the Mayans), who lived in the Nicoya peninsula were the largest and most technologically advanced tribe. Unlike the Borucans who literally scared away their invaders garbed in only scary devilish looking masks, the Chorotegans fought as an organized military group, wearing only padded cotton armor. They only had bow and arrow and wooden swords to fight against more sophisticated weapons. Because of the geographics of the peninsula, the Chorotegans were trapped and thus conquered. The Spaniards killed the Chorotegans for speaking their mother tongue, enslaved them either into slave trade with Panama and Peru, or made them domestic servants. They changed their housing to adobe longhouses and tried to convert them to Christians. The Spanish also brought many diseases such as small pox, causing the indigenous population to decline rapidly. 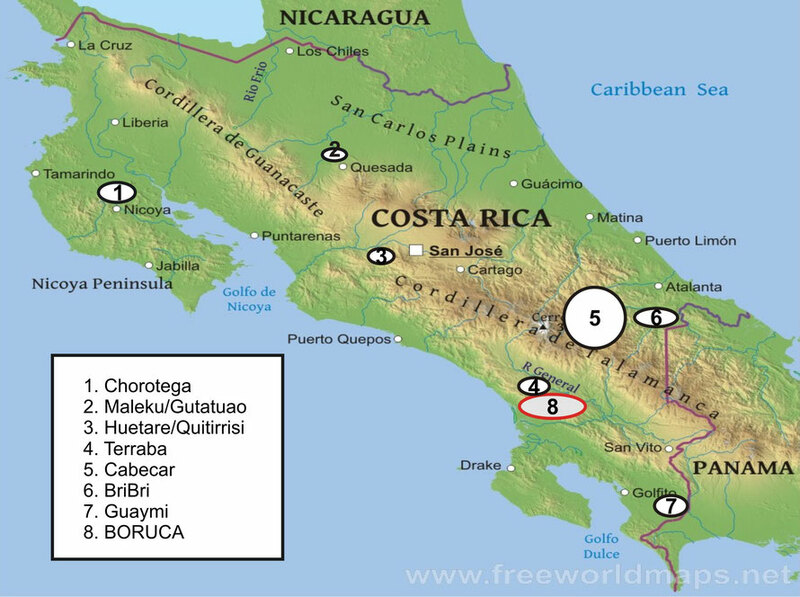 The area of the Chorotegans now centers near Guaitil (Santa Cruz) in Guanacaste. The soil is mostly of clay which was used to make the bricks for the new longhouses. 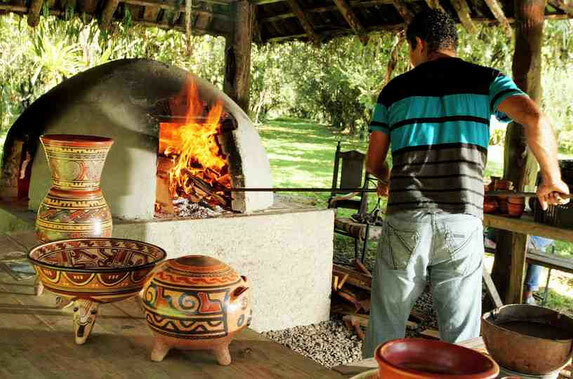 Today, the Chorotegans produce beautifully handcrafted pottery and cookware that are sold to the commercial and touristic markets as well as honey from their beekeeping. Boruca is the only Costa Rican indigenous, (of 8 tribes representing 1.7% of the total country’s population), that were not conquered by the Spanish Conquistadors. Wearing devilish looking masks, they scared the Spaniards away! Not as defensive were the other Indians. Of the Northern Costa Rica tribes, the Maleku are the smallest and most endangered group, numbering 700 people and living on less than 2 square miles of land north of Volcano Arenal. Before the conquistadors they possessed 2,500 square miles, after colonialism 400 square miles. The government act of 1977 implemented 24 indigenous reserves. The Maleku received only 11.5 square miles of which over 60% is inhabited by non-natives! Having lost the majority of their land, the traditional methods of subsistence of hunting and farming was impossible. The main meat of their diet is Iguana! Their native tongue is struggling to survive as well. Their houses, no longer the traditional wood and thatch where they once buried their dead inside with them, are now cement houses. Their economy is based on tourism; buying their crudely carved masks, painted balsa bowls, some ceramics, bow and arrows, and musical instruments. They also give tours teaching about their natural medicines found in the wild. The other northern Costa Rican natives are the Huetar (Quitirrisi), numbering approximately 2000, living on their reserves found just west of San Jose in the area of Cuidad Colon and Puriscal. They have somewhat lost all of their culture, along with their mother tongue. Their land is relatively infertile, corn being their main crop. They still do practice the tradition of "Fiesta del Maiz". The early natives were very wise and had an infinity of the use of medicinal plants, which they still do today. The Huetar’s crafts are baskets, stray hats, woven floor mats colored with natural dyes, and some ceramics. You can find a few roadside stands selling these products. However, the main income is generated by workers finding employment in nearby San Jose.